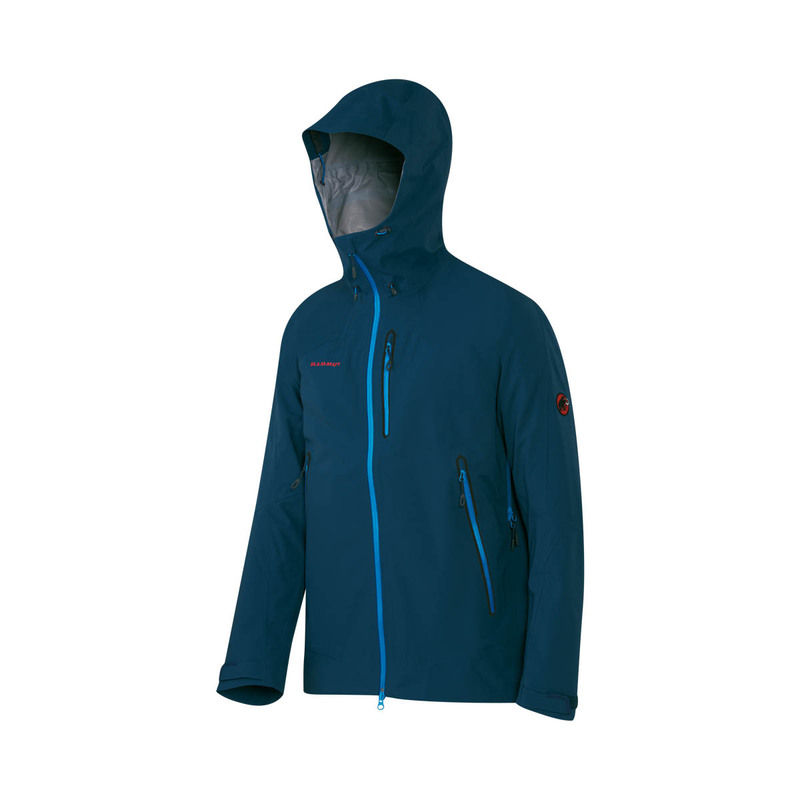 The Mammut Masao Jacket is an alpine-orientated hard shell with a little bit of stretch and articulated arms that’s ideal for any alpine adventure. Made from Mammut’s three-layer, stetchy DRYtech Premium fabric, it’s waterproof, windproof and breathable and will keep you dry and protected from the elements whether you’re ice climbing, mountaineering or going for a bad-weather hike. It’s lightweight and packable, but provides top-notch abrasion resistance for when you’re out there on the rock, and features harness- and pack-compatible pockets for all your climbing needs. Other useful features include a two-way adjustable, helmet-compatible hood, a one-hand-operational drawstring hem, zip-up underarm vents and splash proof zips throughout. It’s also got a multimedia pocket with a cable outlet so you can listen to your music without sacrificing any weather protection. POCKETS 1 inside pocket with zip, 1 multimedia pocket with cable outlet. 2 backpack and climbing harness compatible zipped pockets. DRYtech Premium Three-layer is Mammut’s top-quality, proprietary membrane fabric. It’s waterproof, windproof and breathable to provide the best possible protection against the elements. It has a waterproof / breathability rating of 20K / 15K, meaning it’s not quite as breathable as other membrane fabrics, such as Gore-Tex, but will still keep you totally protected from wind, rain and snow. It’s also a Bluesign-approved fabric, which means it’s been created in accordance to strict environmental policies and guidelines, so you can wear it with peace of mind.